The writing quick press releases guide is meant for everyone. The beginner, the veteran, and the entrepreneur hoping to draw the attention of news & media sources. When I started out writing this guide, I targeted the entrepreneurs. To my surprise, it clicked with those working from home, looking to make money online as a side hustle. You can easily read this guide and start a new gig on Fiverr or Upwork writing press releases. It’s that easy, and seems some are doing it with decent success. But let’s start at the beginning: What is a press release? In brief, it is an statement packed with interesting, exciting information about a product or service. But it is also much more than that. It is your link to the outside world… your key to a world of potential business… your best way of reaching your target audience. Peter Thiel, the famous PayPal co-founder and one of the first investors in Facebook, says in his book Zero to One meant for startups and entrepreneurs, that if you want to sell your company to the public you also have to sell it to the media. In reality though, many great techies develop an amazing product / app but fail to sell it to the media. The truth is that it doesn’t matter how great the product is if nobody knows it is there. This is where public relations and press releases come into play. In order to be successful it is vital for every company and every startup to stay in contact with the media. The starting point for this relationship is the press release. A professional PR agency can write an excellent press release for you but it might not be at the price you want to pay. So why not try writing quick press releases by yourself? Send out that initial press release and see how it goes. You won’t know unless you try! Start by sending out a short press release every now and then. Do it to build your own media list and to get to know more journalists and reporters. I can not stress enough how important is this step for the success of your startup, side hustle, company, etc. This guide will give you all the information you need and for a was less cost than any PR agency. Q: Is The Press Release Dead? Many are complaining of the dwindling effectiveness of press releases in the time of social media and 140 characters tweets. … yet I still listen to it while driving to work and it’s alive and doing well. Same goes for the printed books, and yet I keep buying (and piling) them. Same goes for lots of people and lots of others things. Trust me when I say the following, because I can prove it to you. Editors and reporters still request for press releases. But… which type of press releases? Written to assist editors and reporters to do their job. Yes, a press release won’t help you in SEO or anything of this sort. The press release aims to get the work out, with the help of the global armies of reporters, journalists and editors. Aly Saxe talks about this point further in her article Why Are We Still Talking About the Death of the Press Release? Writing quick press releases is ONE channel in your PR campaign. If you depend on it ALONE, then it will disappoint it. Microsoft has their own news center as well. Uber has their own news room as well. Facebook (the king of the social media movement) has their Facebook Newsroom. …how come the big boys with deep pockets and the best minds still write their own press releases? Who is the Writing Quick Press Releases Guide for? I have tried my best to keep this guide as simple and practical as possible. I want the average Joe to read this guide and write a decent press release under 15 minutes. …they will be able to write decent quick press releases that properly spread their message. The Writing Quick Press Release guide is divided into 8 parts, each section explains the major parts of the press release. Your TITLE should be comprised of 60 to 80 letters, including spaces. Be sure to use the Emotional Marketing Value Headline Analyzer tool. It determines the Emotional Marketing Value (EMV) score of your title. Keep tweaking it until you get the highest score possible. This increases the probability of the press release being read by recipients. Never end your titles with a full stop. Although it’s grammatically correct, it will instruct your readers to stop reading and you don’t want that. Brand names should appear in headlines wherever possible. On average, 5 times as many people read the headline as read the body copy. Click here to return to the index of the Writing Quick Press Releases Guide. The Sub Title/Sub Headline gives more insightful details about the message the press release is trying to convey. Numerals (1,2,3, etc.) improve viewer engagement, according to Sarah Shepard, Business Wire’s regional VP. If you could not add numbers to the main title, do that with the sub title. [CLIENT_NAME_1] and [CLIENT_NAME_2] Announce [NEW_COMPANY_NAME], Inc. Your first paragraph is very crucial, as it means the difference between reading your PR or deleting it. Summarize what you want to say in your PR, and explain why it’s important to read such PR. It’s a de facto standard to start your PR with the [CITY, COUNTRY, DATE]. Always clarify the basic facts in the first paragraph to the receiver. Journalist tend to skim through press releases. Delivering the vital information in the first paragraph helps readers to get a clearer picture of the intent of the press release. For this, you always need to answer the 6 vital questions; What, Who, When, Where, Why, and How. Have these answered instantaneously and you have delivered the desired message in a nutshell. [CITY, COUNTRY, DATE] As Americans make their New Year’s resolutions for 2019, once again, the majority will be more concerned about their waistlines than their wallets, according to the [REPORT/STUDY/INDEX_NAME] from [CLIENT_NAME] Company of North America. [CLIENT_EVENT_NAME], one of the region’s biggest tech shows, kicks off at the World Trade Center today. The six-day show, now in its 25th edition, will feature 9900 technology companies, from countries including US, UK, Germany, Australia and France. It is expected to attract 99,000 visitors. Leading video-game themed military charity, [CLIENT_NAME_1], and [CLIENT_NAME_2], a provider of LAN events and competitive gaming tournaments, proudly announce that [EVENT_NAME] is now the official, exclusive charity of all [CLIENT_NAME_2]’s events. [CLIENT_NAME] has named longtime Vice President of Account Management [CLIENT_EMPOYEE] its first-ever Chief Client Officer. [CLIENT_EMPOYEE]’s commitment to premium customer experiences stem from more than 10 years in successful client relations at [COMPANY_NAME] and other consulting companies. His promotion marks the business’s shift from “old-fashioned account management” toward more fully realized strategic collaboration, and puts further emphasis on customer experience. Starting today and in celebration of the upcoming holidays, [CLIENT_NAME] announced today a huge sale across different franchises including [PRODUCT_1] and [PRODUCT_2] on both the App Store and Google Play. From classic time-management to calories-counting apps, reminders to IM, [CLIENT_NAME] has all iOS and Android devices covered. The sale will run today through Monday, January 5th. Consumer awareness of Ultra HD or 4K TV is growing steadily, and 93 per cent of those who have seen the technology found it extremely or somewhat impressive. These are some of the key findings from the latest wave of XYZ survey, which conducted online interviews with 2001 US participants in November 2014. [CLIENT_NAME], a premier provider of [SERVICE_TYPE] and owner of the leading [CLIENT_PRODUCT_NAME], today released the results of its [REPORT/STUDY/INDEX_NAME] for [EVENT_NAME], which reported significant increases in [PRODUCT_NAME] shopping. Over the past several decades, [CLIENT_NAME] research in XYZ has helped transform the XYZ from a [Condition_1] to a [Condition_2] and today, [CLIENT_NAME] continues its long-standing commitment to the community. [CLIENT_NAME], the not-for-profit world leader in [SERVICE_TYPE], announced today that [DATE] marks the organization’s [X]th year Anniversary of its founding. [CLIENT_NAME_1] (creative director of [PRODUCT_1], [PRODUCT_2] and [PRODUCT_3]) and [CLIENT_NAME_2] (executive producer of [PRODUCT_4], [PRODUCT_5], [PRODUCT_6]) join forces to create a new independent videogames studio [COMPANY_NAME], Inc. Founded by two of the most experienced executives in the history of [INDUSTRY], [COMPANY_NAME] is dedicated to pushing the design of [PRODUCT_OR_SERVICE] in bold new directions. Online retail spending in [COUNTRY] will exceed $1 trillion by 2019, according to a new forecast from [CLIENT_NAME], up from $307 billion in 2013. The [COUNTRY] Online Retail Forecast 2014 – 2019 also estimates that spending via mobile will grow at 44.2% compound annual growth rate (CAGR), twice as fast as online sales, which are estimated to grow at 19.9% CAGR. Now that your first paragraph has caught the attention of the reader, what else do you want to tell them? Remember to state your Call To Action (CTA). The second paragraph is always reserved for elucidating the message further and painting a broader image for the reader. What do you want the reader to do after reading your PR? Visit your store? Buy your product? Subscribe? Etc. Make it loud and clear. The event, scheduled for [DATE] at the [LOCATION_NAME], will provide a forum to exchange ideas, showcase best practices and ultimately help its participants drive growth and increase market share. In terms of bad financial habits that are holding people back from achieving their financial goals, [SURVEY/STUDY] results were similar to previous years. Top responses this year included “failed to save any money” (28%), “buying too many things not really needed” (27%) and “saving some money, but not as much as I wished for” (24%). When asked about the one thing they could do to improve their finances in 2015, most respondents said “pay off credit cards” (19%), followed by “build up my emergency savings” (17%) and “increase my retirement savings” (14%). Just over one-third of all [CLIENT_ NAME]’s online revenue came from shoppers on mobile devices, up 48 per cent over last year. Ninety per cent of these consumers were on Apple devices. [CLIENT_ EVENT_NAME] was a great success across the board – numerous highly-qualified attendees, a lively expo floor, insightful and cutting-edge educational sessions, plentiful networking opportunities and a picture-perfect locale. Launched in 2013, [CLIENT_ EVENT_NAME] gathers forward-thinking beverage companies and professionals to meet face-to-face with key buyers. They included producers, distributors, importers, exporters, interested individuals, and representatives from governments and international organizations. Experts from the world of industry and academia are invited to submit a paper within any area of functional nutrition; from new technologies and scientific research to innovations in processes and products. The [CLIENT_ EVENT_NAME] continues to take an active part in shaping the beverage industry, bringing together key stakeholders and thought leaders, as well as scientific theory and business practice. The [CLIENT_ EVENT_NAME] will feature more than 1234 global suppliers, coming from XYZ countries , to display their state-of-the-art machinery, innovative ingredients specially developed to meet new trends in local taste, and the latest advances in packing and packaging. [CLIENT_NAME]’s focus is clear – strengthening and building on the technical experience that exists within the region, and a keen understanding of the diversity that permeates the [CLIENT_REGIONS]. In addition, [CLIENT_NAME] is expanding its advertising campaign into Europe and Australia for the first time, and will continue to advertise in the U.S., U.K. and France markets. [CLIENT_NAME] plans to launch more advertising campaign in additional markets later in 2015. Focus and consistency are key elements in [CLIENT_NAME]’s vision to be the market leader in the region. If you want the media and press to carry your press release, then make sure you include some statistics and figures. Stats and numbers give the reader concrete evidence that the news is legit. This also allows you to keep the superlatives to a minimum while delivering noteworthy and valid information. If you can’t provide those, you can use others from world-renown sources; the UN, governmental websites, indexes, etc. Remember, using stats and figures can make or break your Press release’s chances of being read. The worldwide product market is expected to see a massive deceleration in 2018 with year-over-year growth slowing to XYZ%, down from ZXY% in 2017, according to a new forecast from [SOURCE_NAME]. The analysis uses [SOURCE_NAME]’s extensive labor market database, which pulls from over XYZ national and state employment resources. The percentage of respondents who are aware of the term “Ultra HD” rose from 39 per cent in January 2014 to 57 per cent in November. Awareness of the other terms, “4K TV” and “UHD”, has also risen but remains lower than “Ultra HD”. Nearly a quarter (23%) of respondents said they are more likely to seek the advice of a financial professional in 2015, up from 19% in 2013. More Americans (36%) selected [SURVEY_DISCOVERY_1] as their top choice, ahead of [SURVEY_DISCOVERY_2] (28%), [SURVEY_DISCOVERY_3] (23%) and [SURVEY_DISCOVERY_4] (13%). 46% needed help learning how to use their new devices. 71% reported that no one had given them any instruction or guidance. 29% of those who did receive help with their technology received it from a family member. 16% are puzzled or intimidated by their new devices. It has become a standard to include a quote from a top executive in your company. Make it a worthwhile quote with reliable and useful information. You can quote one or two executives but not more. Always remember to quote people who are available for interviews. A journalist covering your press release will appreciate that the person being quoted is available to add more valuable information, if necessary. If you have no one to quote, Prof.Net is an online community of communications professionals made to provide reporters access to expert sources. If you can’t find the quote you want, request it. “At [CLIENT_NAME], we believe that our differences are not only worth recognizing but something to celebrate,” said [CLIENT_QUOTER]. “With the average car owner keeping their car for 10 years, drivers should resolve to stay on top of their car’s recommended maintenance schedule,” said [CLIENT_QUOTER], a [CLIENT_NAME] spokesperson. “With a healthier U.S. economy, sustained market growth and lower unemployment, people have forgotten the trauma they experienced in 2008-2009 and have more confidence in the state of their finances,” said [CLIENT_QUOTER], vice president of [CLIENT_NAME]. “We’ll work harder than ever to build and refine strategies highly optimized against our clients’ goals,” [CLIENT_QUOTER] said. If your press release is more than 1 page long, remember to use ‘-more-‘ at the bottom of every page. At the end of your press release, it’s the standard to use ‘###‘ to denote the end of your press release’s content. Year founded, line of work, website link, market share, any awards won lately, number of customers served, etc. For over 20 years, [CLIENT_NAME] has been the premier provider of competitive interest rate and product information to financial institutions across the United States. [CLIENT_NAME] is the global leader in [CLIENT_FIELD], helping companies target and attract great talent. [CLIENT_NAME]’s online website, [CLIENT_WEBSITE_NAME], is the largest in the [CLIENT_COUNTRY] with more than 24 million unique monthly visits and 1 million subscriber. [CLIENT_NAME] and its subsidiaries operate in the United States, Europe, South America, Canada and Asia. Since 1880, [CLIENT_NAME] and its affiliates have provided financial security for individuals and businesses in the form of insurance, investments and retirement plans. More than 50 employees in Europe, Australia and the USA achieved sales of $23.5 million in 2014. [CLIENT_NAME], headquartered in Silicon Valley, went public in 2000 and has been listed under the symbol “PRESS” on the New York Stock Exchange since April 2010. To learn more about [CLIENT_NAME], please visit [CLIENT_WEBSITE_NAME]. [CLIENT_NAME] is a division of [CLIENT_MOTHER-COMPANY], Inc.
Never underestimate the benefits of showing your contact information. Yes, you’ll get lots of love form spammers. But you will also be contacted by possible leads, partners, promising media members, etc. There are certain words that tend to generate best results when used in your text copy. For instance, the psychology department at Yale University studied the top 10 powerful words in the English language and found them to be: Easy, Results, Save, Discover, Guarantee, Safety, Health, Love, Money, Need, Proven, You. Another list that needs to be read, although it caters for a different audience is David Ogilvy’s Power Advertising Words list (from his book: Confessions of An Advertising Man) and they are: Amazing, Announcing, Bargain, Challenge, Compare, Easy, Hurry, Improvement, Introducing, Magic, Miracle, Now, Offer, Quick, Remarkable, Revolutionary, Sensational, Startling, Suddenly, Wanted. and follow it with the hashtag (#MyProduct) you want the media to use on the social networks channels. to your Contact Info at the end of your PR. to determine the Emotional Marketing Value (EMV) score. Keep tweaking your title until you get the best possible EMV rating. Use the online and free tool Grammarly. It claims to correct over 250 grammatical mistakes. It also hunts contextual spelling errors and poor vocabulary usage. Journos hate nothing more than a weak press release full of mistakes. Beginners have a preconceived notion that putting an exclamation mark catches attention, but to the receiver. It sounds more like being persistently barked at by an overly-enthusiastic dog. That is an unpleasant sensation. Keep the exclamation mark to bare minimum. Don’t fluctuate the tense from future perfect to present continuous to present perfect, unless necessary. Keep a stable tone without varying. After writing your quick press releases, review and proofread them after a healthy break. This gives your mind enough time to reset, rejuvenate, and de-saturate from the task of writing a press release. Your mind will be in a better frame, allowing you to find any subtle nuances that require editing. Once ready, send a high-priority press release to few colleagues to gauge their reaction. It always helps to get a third person’s perspective over any sensitive matter. Treat the press release like your résumé. You won’t be sending the same resume to everyone, would you? Of course, editing it for every receiver is a daunting task, but make subtle tweaks to enhance it for a particular high-profile receiver. Make changes to emulate the tonality and the attitude of the receiver. Add an extra line or two, if needed. PDF makes the press release look formal and concrete. However, it is difficult to copy from a PDF to an article for a journalist. Hence, adding a word file of the press release comes in handy. your press release should be , but it’s safe to claim that your press release should not be less than 300 words long and should not exceed 2000 words, unless you have a damn good reason to do that. Now that you have a Press Release ready to be sent out to media members, it’s time to decide which list of publications, media agencies, newswire services to use. Search for the right media members that would be interested in posting your press release. Pick 5 (or 10 maximum) names and get their email addresses. Call up to confirm those email IDs are correct and valid. Then call again after sending your PR to confirm that they have received it. Remember to address your email with the name of the person receiving it. Post your press releases on your website, and optimize your keywords. Create a series of special social media posts around each press release. Your company name is probably not that famous yet, and so a cold email won’t get you that far. A warm phone call will. Don’t be pushy but instead offer to help the journalist or editor you are talking to. At the end of the day, journalists need to deliver content and to write X amount of words before they can head home. You can comment on any breaking news, quote based on your experience, and so on. Remember to send out season greetings cards, with your hand-written warm wishes, and make sure to have the rest of your team signing those cards as well. It won’t move mountains, but it will make wonders! Trust me, I was a journalist for over 10 years. To put the guide to the test, I’ve used it to write my first press release to announce this guide. Promoting a business venture isn’t easy in today’s saturated media markets. Yet it can be done, and one way is still with an effective press release. A new eBook promises to improve your press release in just a few easy steps. Whether it’s traditional journalists or cutting-edge bloggers, studies show that the typical press release is dead in the water before it reaches the editor’s in-box. Mr. Shabayek’s eBook offers ways to create quick press releases that will make it past the initial review. This is crucial in a world where a press release is worth thousands in publicity, if it makes it to publication. Even as pathways to success expand, entrepreneurs face more hurdles than ever. According to a recent study by the University of Southern California’s Annenberg Foundation, corporations are spending more money than ever on public relations. Increases of 25 to 30 percent are common in the last few years. This makes it harder than ever for the entrepreneur to catch a break, and it makes it more critical than ever that resources are available for these entrepreneurs. The eBook Writing Quick Press Releases promises to be one of those resources from which the average person can benefit. The Annenberg Foundation study also revealed an opportunity for freelance PR professionals and entrepreneurs alike. It seems that corporations are 50 percent less likely to have a single PR firm on retainer. This means that the field remains open for those who are working their way up. 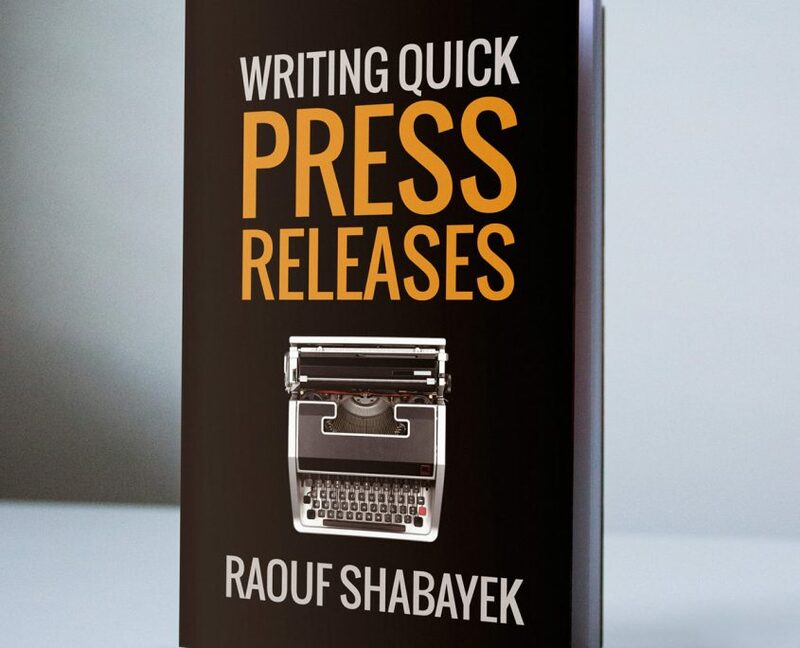 Mr. Shabayek’s book taps into this potential as it offers a reader the chance to succeed at the difficult and definitely important task of writing successful press releases. Writing Quick Press Releases is available for free download from Smashwords https://www.smashwords.com/books/view/507123. The free download can be accessed on Nook, Kindle and any iOS / Android tablet. There is also a PDF version. The extended version is available from Gumroad https://gumroad.com/l/QuickPR. To speed up the writing process, the extended version allows you to cut and paste. This makes it even easier to create your own press release using the author’s suggestions. … You definitely need to read some real life examples of how a successful press release boosted sales. If you have any recommendations, suggestions, additions, do not hesitate to contact us.